Alex Bo yé is no stranger to the entertainment and music industries. 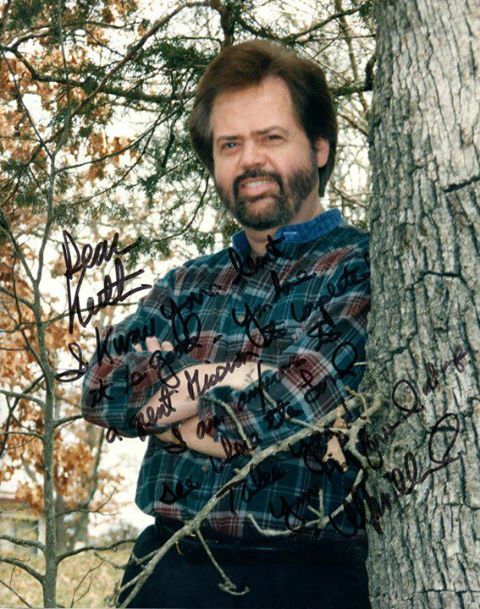 He has been performing for audiences worldwide for over 15 years, and has to his credit hits in over 15 countries, with over half a million CDs sold. According to his Mormon.org profile, Boyé states that he has been blessed to share the stage with such entertainers as: Bryan Adams, George Michael, Simon & Garfunkel, MC Hammer, Vanilla Ice, N’SYNC, Jay-Z, The Backstreet Boys, Jordyn Sparks, Dancing with the Stars winner Derek Huff, Missy Elliott, Mary. J. Blige, David Archuleta, and the Smashing Pumpkins. 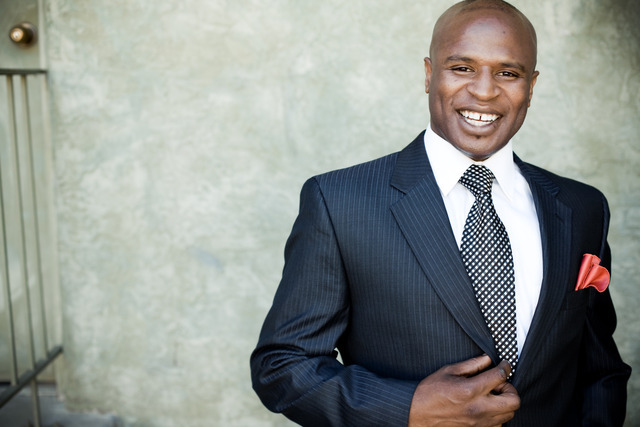 As an entertainer, Boyé has also performed on stage in such places as the MGM Grand in Las Vegas, and once had a cameo appearance on the CBS sitcom How I Met Your Mother. His astounding musical endowment has also been featured in several LDS movie soundtracks to include Charly, The Dance, Suits on the Loose, Church Ball, and Baptist at Our Barbecue. Boyé was born in 1970 in London, England. He grew up in the Tottenham Court neighborhood, an area of north London in the London Borough of Haringey, England, situated 6.6 miles (10.6 km) from Charing Cross. The area was described as somewhat of a rough neighborhood. His parents are Nigerian. While pregnant, his mother went to London while his father remained in Nigeria. For the first few years of his life Boyé returned to Nigeria to live with his father, and his mother remained in London where she worked for the London underground cleaning tracks at night. Much of his youth, however, was spent in foster homes where he was raised by Caucasian parents. Even as a youth he was musically inclined and enjoyed the Motown sounds of such artists as Stevie Wonder, James Brown, Kool and the Gang, Marvin Gaye, Jackie Wilson, and Otis Redding. At the young age of 16 years, Boyé worked at a McDonalds in London. It was there that he was introduced to The Church of Jesus Christ of Latter-day Saints (sometimes referred to as The Mormon Church) by a manager. He was baptized soon thereafter without his mother’s knowledge. He later served a full-time mission for The Church of Jesus Christ in the England Bristol Mission. He was blessed with the opportunity to sing regularly while on his mission, and shortly after his mission, partly due to the encouragement that he had received from his Mission President, he chose to pursue a music career “so I could use my music to influence and inspire people for good.”  In 2009 he did just that when he raised money from the sales of his single Crazy for you to buy a house for a local refugee family. He met his wife, Julie, in an LDS singles ward and the two were married for all time and eternity in the Salt Lake Utah Temple. Julie earns a living as a business manager. Together they have three children – Adanna, Zander, and India. In the spring of 2013, the Church of Jesus Christ launched an “I’m A Mormon” campaign in Britain. Boyé participated in that campaign through means of a video that featured him. Boyé’s music has not always been gospel-oriented. His music career began as a member of a popular boy band in England. He left the band in 1999 to pursue a solo career. That proved to be an inefficacious move on his part. He lost everything to the record company – the apartment, the clothes, the phone, and the money. Notwithstanding his loss, Boyé pressed on, and in 2000 he released his first solo album, No Limits, a mixture of pop and R&B, which reached number 12 in the European charts. Boyé recalls that one Sunday in England while attending Sunday school in The Church of Jesus Christ of Latter-day Saints, the Ward Mission Leader entered the room with a box full of copies of the Book of Mormon and handed each person a copy. Along with that came the challenge to give the copy of the Book of Mormon to someone that week, and then report back the following week as to whom the Book was given to. He recounts that he was on tour that week doing a performance for a charity organization called The Prince’s Trust, an event where the accomplishments of inner-city kids are recognized. One day there was a loud knock on the door and the person knocking announced that Prince Charles wanted to meet everyone. As he ran downstairs with his band to stand “on ceremony” the thought occurred to him to go back upstairs to his room. Without knowing the reason why he should return to the room, he did so, and noticing the copy of the Book of Mormon given to him by his Ward Mission Leader, he stuck the book in his back pocket and headed back downstairs to take his place in line. As Prince Charles approached his helicopter to leave, Boyé felt strongly inspired that he needed to give the copy of the Book of Mormon to Prince Charles. In order to get the attention of Prince Charles who had already passed him, he broke the rules of protocol by stepping out of line, waving his hands in the air, and calling out for Prince Charles. Realizing what he had done, he stepped back into line and hung his head in embarrassment. When he looked up he noticed that Prince Charles was standing directly in front of him. He then said, “On behalf of my church I would like to give you a gift.”  Prince Charles accepted the Book of Mormon and responded to Boyé that he thought it would prove some interesting reading. Boyé then responded, “Yes it will. Perhaps you could read it in the helicopter on your way home.”  Prince Charles stated that he might do just that and then he departed. On February 22, 2012, Boyé became a United States citizen in a ceremony at Rose Wagner Theater in Salt Lake City, Utah. At the ceremony he was invited by the judge who was conducting to sing The Star-Spangled Banner. So, what is next in line for Alex Boyé? Boyé is also a member of the world renowned Mormon Tabernacle Choir. 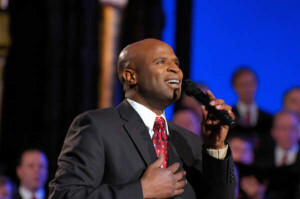 Alex Boye’ was born and raised in London, England. He joined the church at the age of 16. He later served an LDS Mission to England Bristol. 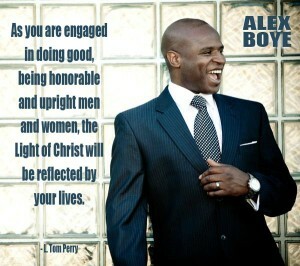 Alex sang regularly on his mission, and from the encouragement of his Mission President, pursued a career in music when he got home. Alex became the lead singer in the European Boy band “Awesome”, and signed a recording contract with Universal Records in 1996. 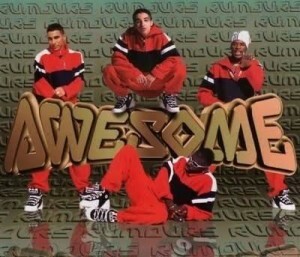 The band had hits in over 15 countries, selling over half a million Cd’s and performed alongside such groups as N’SYNC, The Backstreet Boys, Missy Elliott, Bryan Adams, Mary. J.Blige, The smashing Pumpkins, and George Michael to name a few.